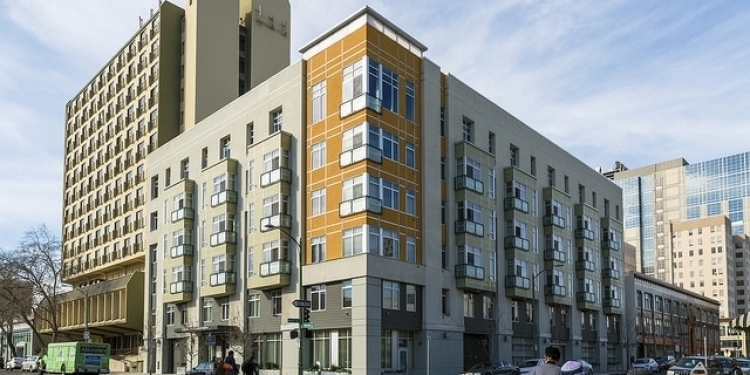 Measure A1 would support building more affordable housing in Alameda County, like the Harrison Street Senior Housing project in downtown Oakland. Photo by Sergio Ruiz for SPUR. In November, residents of Alameda County will have the opportunity to make their cities more affordable by supporting Measure A1. This $580 million bond would fund the creation of permanently affordable rental housing, help moderate-income households afford home ownership and make existing housing for low-income seniors and people with disabilities safe and accessible. $460 million of the funding would create rental housing, and $120 million would go to support homeownership programs. Measure A1 is badly needed. The Bay Area is experiencing an extreme shortage of affordable housing. In Alameda County, rents increased 34 percent between 2011 and 2015 and home prices increased 22.5 percent between 2014 and 2015. Oakland is the fourth most expensive housing market in the entire country. At the same time, resources for affordable housing took a severe hit when California eliminated state redevelopment agencies in 2012, making it even harder to create affordable housing at a time when it’s needed most. The problem has not gone unnoticed. Mayor Schaaf’s Housing Implementation Cabinet called for protecting existing homes of low-income families, as well as creating new permanently affordable housing. The cabinet’s report recommended a new county bond for affordable housing, as well as a local Oakland infrastructure bond to help nonprofit housing groups acquire and rehabilitate existing low-income housing in order to keep it affordable. At the same time, affordable housing advocacy groups like the Non-Profit Housing Association of Northern California and East Bay Housing Organizations have been hard at work looking for ways to fund the creation of affordable housing. After considerable advocacy from both affordable housing groups and the City of Oakland, the Alameda County Board of Supervisors placed this measure on the ballot. SPUR is proud to support Measure A1. For more information, or to get involved contact the campaign for an affordable Alameda County. Zillow Rent Index (ZRI), Median Rent Series. In Alameda County Board of Supervisor’s Board Packet presentation for June 28, 2016. Multiple Listing Service (ZRI). In Alameda County Board of Supervisor’s Board Packet presentation for June 28, 2016.